Aligning instruction and assessment tasks to a specific foundation skill level is relevant to each phase of learners’ engagement with training. Prepare tasks to identify foundation skills the learner CAN demonstrate? Use the information to identify the learners’ foundation skill needs Prepare tasks to build and support learners’ foundation skill development. Prepare tasks to enable learners’ to reveal foundation skills progress. Use the information to consider what strategies effective ir not effective. Prepare tasks to enables the learners to demonstrate competency at the required foundation skills and knowledge? Use the information to determine successful or not successful assessment results or course completion. If you aim to identify, instruct or assess a specific core skill at a particular level of competency, then the outcome will be enhanced if there is regard to aligning the task (stimuli and instructions) to the intended foundation skill. Whilst some units of competency state very clearly the LLN (ACSF) or Employability skills (CSfW) level, many do not. The progress is interrupted by the recent cessation of the Industry Skills Councils and transition to Industry Reference Groups and Skills Services Organisations. For many trainers, having regard for the ACSF or CSfW is necessary. Wherever the starting point – identify, instruct, or assess – a task is involved. Initiates the first thoughts – what do I know about this? Example: Read…., Listen ….., Watch …. Examples: Explain, …….Demonstrate, ……. Produce …. Why is it important to pitch the task at the required foundation skill level? Who/What is impacted? Formative and summative assessment that informs planning and delivery – what’s working and what’s not – is compromised. Is the task pitched higher or lower than the training demand? Does the stimuli content align with the learners’ reading competency? Does the stimuli context align with the core skill level to be assessed? Is the stimuli an authentic workplace document or have authentic workplace relevancy? Are the targeted core skills required to engage with the stimuli? Are the instructions written to enable most learners to access them? Do the instructions require the intended skill to be used at the intended level? Have the instructions been trialled for effectiveness? Does the task enable the learner to reveal competency with the specific performance features of the skill and level? The Performance Variables (pge 5) describe the factors that will influence performance at any one time: context complexity, text complexity, task complexity and the level of assumed support or independence expected. The document includes a one page chart showing the four Performance Variables across the 5 ACSF levels. Each core skill and levels also states the associated Performance Variables. The performance variables provide a useful quick reference guide, but you may want to check other sections to be sure. Sample Activities for each core skill and level are provided as a guide. Check out the activities suggested in the Education and Training, Workplace and Employment domains. Are there similarities to what you aim to identify, Instruct, assess? Specific details can be found in the core skill Focus Area and Performance Features. Some trainers find the Performance Features Grids in the Appendices a helpful section as the Performance Features for each core skill across the five levels are located together. The document provides a table titled Generic Descriptions of Stages of Performance across the five stages of development (Novice to Advanced performer) in a broad summary format. AND the Skill Areas (10 of these) may help to locate the type and level of employability skill you are aiming to identify, instruct or assess. There is a table that combines the Skills Clusters and the Skills Area,, explaining what each of the skills is ‘about’. The Focus Areas state the range of employability skills that align with the Skills Areas. The description of the performance behaviour for each Focus Area and Stage of Development is located within the Performance Features tables. This reveals the specifics. The CSfW includes Influencing Factors, which, are broader than the 4 ACSF Performance Variables. Like the ACSF Performance Variables, the Influencing factors have the potential to impact performance at any point in time. But unlike the ACSF, the Influencing Factors are not aligned in the Skills Clusters or Focus Areas by Stages of Development. The Manufacturing Skills Australia site continues to retain the foundation skills resources. There are literacy and numeracy indicator tools (updated in 2015). The resources include the questions mapping to the ACSF. You will need to create a login to the site (accessed 15/3/16). Does the validation include explicit checking that the task stimuli and instructions align with the intended LLN skill and level? Adult Learning Australia have a Linked in Adult Literacy Network. Using a webinar platform, the ALA offer opportunities for members who want to submit tasks for validation against the ACSF, The sessions are presented by Philippa McLean; a key contributor to writing the ACSF. Validated tools are then stored and available for others in the network to access. Connect with like-minded peers/colleagues. Is there a network available that is open to informal discussion, information sharing, and reflecting on effectiveness? Ask Chemène or I via this website, or send an email to llnandvetmeetingplace@gmail.com, or give us a call (phone numbers in the right column near the top. Why are these acronyms relevant? No doubt you are aware that foundation skills are under the spotlight. As training professionals we are encouraged to raise the foundation skills profile; shifting their presence from implicit and assumed, to explicit and planned to be part of each stage of training delivery. Each VET course and each VET unit has foundation skills within the Performance Criteria tasks and the Required Skills and Knowledge. Identifying the ACSF (LLN) core skill and the CSfW (Employability Skills) is the first step to bringing these to the forefront of planning, instruction and assessment. 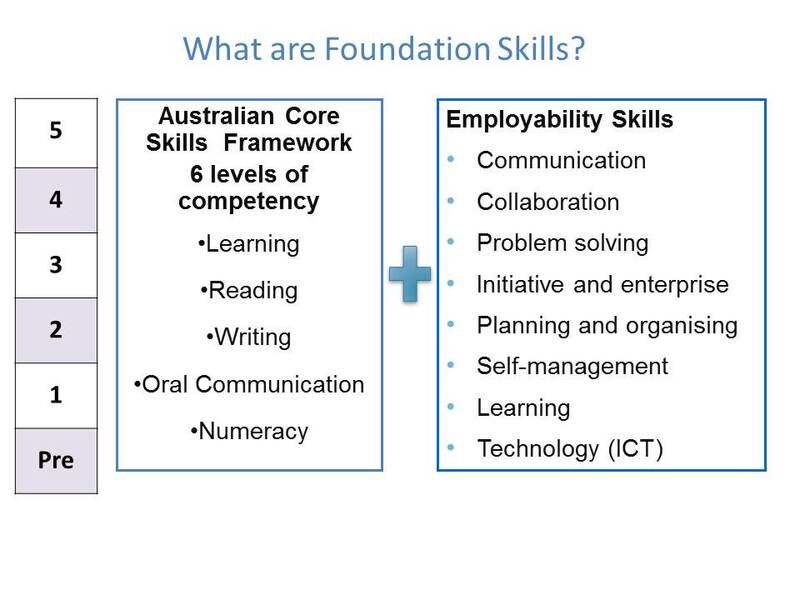 Both the Australian Core Skills Framework (ACSF) and the Core Skills for Work developmental framework (CSfW) are nationally developed frameworks. Each presents stages of development across levels of performance. Each provides a common language and reference points to discuss or address particular skills. The ACSF presents descriptors that relate to the life-wide participation of adults in community, the workplace, or education/training contexts. The CSfW descriptors relate to employability skills within the workforce practice, or workforce training: navigating the world of work, interacting with others, and getting the work done. communicate about aspects of training content and context using consistent descriptions (the foundation skills involved). articulate the foundation skills and knowledge of those participating in the training, their skills, knowledge or understanding, observed or revealed through their responses. (knowing the learners). is not necessarily fixed or permanent, there is scope for development. in any single descriptor/indicator is usually dependent on capacity of more than one related descriptor/indicator. is dependent on the context, and can vary from one context to another. takes time to develop. A complex matrix of inter-related variables impact on learning and transformation. LLN is an acronym for Language Literacy and Numeracy – generally used to represent the core skills embraced in the Australian Core Skills Framework (ACSF) – Learning, Reading Writing Oral Communication and Numeracy. Funded by the Department of Industry, the Foundation Skills Assessment Tool (FSAT) is currently being developed by the Australian Council for Educational Research (ACER). The tool will involve identification of an individual’s capacity against both core skills (ACSF) and employability skills. Information provided on the link explains how the different skills will be assessed. Currently RTOs have volunteered to be involved with the trials of the tool, then following necessary adjustments it will be available freely for use. The ACER want more RTOs to be involved with the trial stage, so register your interest. FSK can represent Foundation Skills, or, is more commonly known to represent the Foundation Skills Training Package (FSK). It is intended that the Foundation Skills units, or courses (FSK10113 Certificate I in Access to Vocational Pathways , FSK10213 Certificate I in Skills for Vocational Pathways, FSK20113 Certificate II in Skills for Work and Vocational Pathways) are delivered within a vocational context to support the foundation skill development that may be necessary for people undertaking workplace training. If you have any questions – contact us. We welcome your interest.